Kickstart your morning with a refreshing glass of homemade juice with an extra little bit of spice from fresh ginger. Watermelon, lemon, oranges, and ginger are processed through a juicer to deliver you a morning or afternoon refresher. You can enjoy this with your morning coffee and a hard-boiled egg or after a workout for a thirst-quenching beverage. 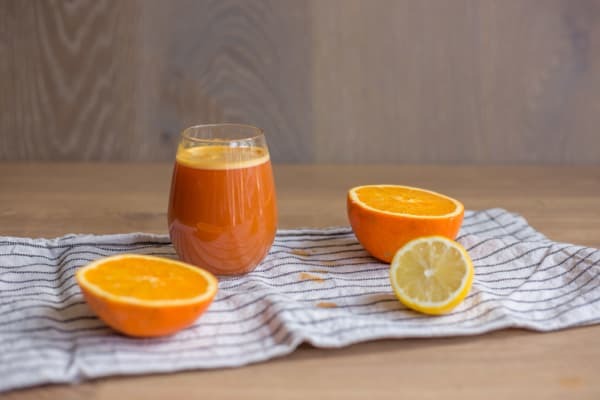 Whenever you have it, you'll be happy you do... this juice is packed with flavor and Vitamin C! Swap the ginger with 1/2 cup fresh mint for a hydrating, minty juice. A grapefruit instead of the lemon keeps the tang, but adds a lighter flavor to the drink. Toss in some strawberries for an even more beautiful red color. Blend the juice with some ice or frozen mango in the blender for a frothy and thicker beverage. Per Serving: 209 calories; 1g fat; 52.9g carbohydrates; 4g protein; 0mg cholesterol; 7mg sodium. Want to add a little somethin' somethin' to your basic orange juice? Juice these babies. So good and makes me feel ready for the day. It's a great ready to get some pep in your step. Good recipe! Make sure to get seedless watermelon!